Pom Pom’s Teahouse and Sandwicheria provides both conventional and unique sandwiches and handcrafted teas. Though the restaurant lacks ample seating space, the intimate environment serves as a great place to eat. Pom Pom’s main draw is it’s tea, ranging from standard milk teas to unconventional tisane teas. All teas are handcrafted to ensure proper flavor and consistency. Both hot and iced versions are available for all teas, which helps the customer try new styles while still working within their preference. Herbal teas, like Arabian Mint ($3), balance both a luscious, hydrating flavor of mint and the deep, natural taste of herbs. Original teas, like Looibos Love ($3), display the unique flavors of the restaurant, creating a light, but refreshing sweet tea. 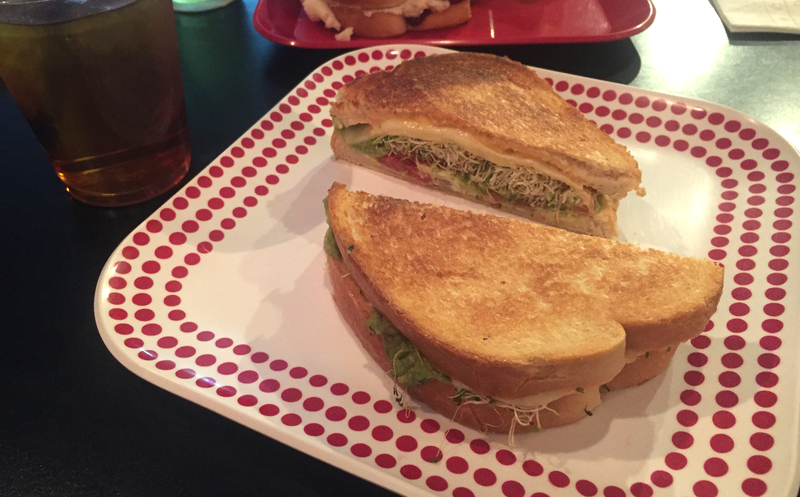 Pom Pom’s earns its title as a “sandwicheria,” as it creates and serves delicious sandwiches that pack flavorful ingredients in their sandwiches that blend perfectly together. Both meat and vegetarian options are available, which gives customers more inclusive options. 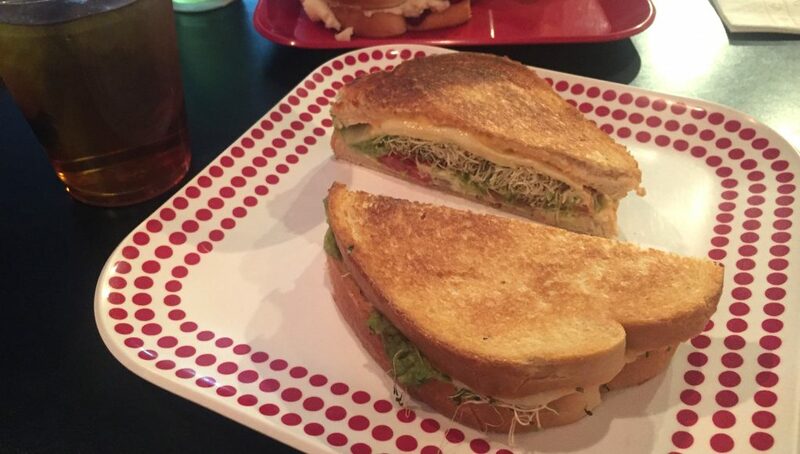 The Veggie sandwich, the most popular vegetarian option, ($7.99) includes fresh vegetables, including alfalfa sprouts, red onions and avocados. The sandwich also includes cream cheese, which might turn some off of the dish, but it completely ties it together. The pristine balance of all the ingredients creates an amazing vegetarian option, in a sandwich shop famed for their meat sandwiches. An unconventional option, Mama Ling Ling’s Thanksgiving Dinner pressed sandwich ($8.50,) tasted like a holiday dinner in each bite. 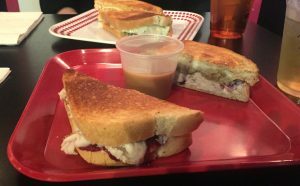 The sandwich includes turkey, gravy, mashed potatoes and cranberry sauce, all Thanksgiving staples, between two big slices of sourdough bread. Though the combination of all the rich flavors would seem overwhelming, each bite combines all the flavors in a light, delicious way. Alternative food options are available for those who may not want teas or sandwiches. With eight salad options, served on a plate of locally-grown fresh greens, Pom Pom’s provides even more variety to one’s lunch or dinner. The house salad ($6.99) offers a variety of dressings one can add to their order. The ginger dressing option was disappointing as it was too spicy, and it took away from the rest of the crisp salad. The creamy basil dressing offers a much better choice, as it adds a different taste sensation of cream, but still provide an earthy, green taste. Sides, including noodles and German potatoes ($1.65) are also available additions to any order. These add variety in tastes and styles to each order. One of the only drawbacks is the lack of available seating space inside the restaurant. The kitchen and the seating areas all share one main room. The seating arrangements are one long padded bench with supplementary tables and chairs and one large table with the Hindu god Ganesha painted on it. Pom Pom’s uses these tables to accommodate large groups or provide community dining, which allows guests to meet new people as they dine together with an opportunity to meet new people, who are also sharing the table with them. The restaurant holds a maximum of 30 people. While the small space does provide a intimate setting, the overall restaurant itself is cramped and practically begging to move into a new venue. Though cramped, Pom Pom’s Teahouse and Sandwicheria serves as not only a great restaurant with both common and peculiar options, but a small alternative hide-a-way in Orlando.